Get it while it’s hot: Health Wonk Review: NBA Playoffs Edition – posted by Jason Shafrin at Healthcare Economist – a lean & clean compendium of what the health policy wonks are talking about. Bloggers are taking over the world – We attended a few days of the Risk & Insurance Management Society (RIMS) annual meeting in Boston this year and were happy to have the opportunity to meet with four fellow bloggers: Joe Paduda of Managed Care Matters; Roberto Ceniceros, an editor at Business Insurance who blogs at Comp Time; Cara Barde, President and COO of Total Medical Solutions, which sponsors the Work Comp Complex Care Blog; and Peter Rousmaniere, workers’ comp columnist at Risk & Insurance who has the Working Immigrants blog. We also chatted with Bob Wilson, founder of one of the online pioneering sites, workerscompensation.com – a valuable resource that gets better with time. So many white crosses – “Look around your workplace tomorrow and imagine 29 people gone in one instant.” Ken Ward posts a moving account of the final farewell to the deceased miners: Coal miners memorial: So many white crosses. Former Massey Mine worker to Congress: “People shouldn’t have to work like that” And in today’s news: two miners missing in Kentucky. Jordan Barab video – Jon Gelman features a video clip of testimony that Jordan Barab, Deputy Assistant Secretary, OSHA, made before the U.S. House of Representatives Subcommitttee on Workforce Protections on Workers’ Memorial Day: Facing unacceptable hazards in the workplace. Many of our readers will remember Jordan Barab as the passionate advocate for worker safety on his now-retired blog Confined Space. BPEP oil rig explosion – At Today’s Workplace, Lindsay Beyerstein has compiled a history of safety violations for BP Exploration and Production (BPEP), the company that held the contract for the oil rig that exploded off the Louisiana coast. Liz Borowski at The Pump Handle has more on the missing miners and the decision to call off the search. At III’s Insurance Industry’s Blog, Claire Wilkinson posts that the oil spill continues to worsen – and despite the event being a man-made catastrophe rather than a natural one, the scope of the disaster may prompt a federal disaster declaration. 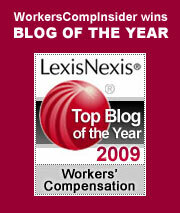 Giving kids a chance – Over at LexisNexis, Robin Kobayashi posts about Kids’ Chance, a nonprofit formed with the mission of providing scholarships to children of workers seriously injured or killed on the job. Founded in 1988 by Georgia attorney Robert Clyatt, today there are programs in more than 25 states. Check out Robin’s post to learn more. CT comp chimp case – The Connecticut Senate has approved a bill allowing police officers to seek workers’ compensation for stress after using deadly force on mammals. The bill awaits House action before going into law. We’ve blogged about Officer Chiafari’s ordeal previously, as well as that of the victim. Hopefully, this bill won’t need to be called into use very often. This entry was posted on Thursday, April 29th, 2010 at 1:14 pm	and is filed under News roundups. You can follow any responses to this entry through the RSS 2.0 feed. Both comments and pings are currently closed.